It’s amazing that you can get so much sugar in something for such a low price. The cavalcade of gluten free, vegan food continues! My stars, but aren’t we having fun? 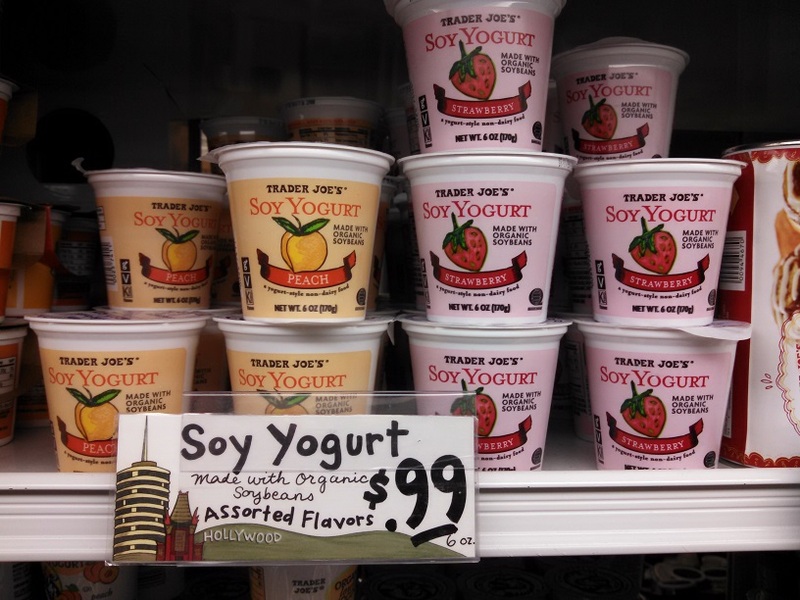 Trader Joe’s Soy Yogurt is yet another entry in their huge wall of yogurt variations. This one leaped out at me in particular for it’s soy nature. After having such a good time with the non-ice cream, Soy Creamy, it seemed like a natural follow up. The results were similar – tasty, if you’re willing to accept a certain level of soy bean aftertaste. You may have noticed that I review a fair number of yogurts. The rather mundane reason is that I habitually have one for breakfast, Monday through Friday, and have done since before I can remember. In fact, my yogurt habit is rather more than habitual. A not insignificant part of my life is run off of what I like to call the “yogurt clock”. As the most modular food in my diet, I use the yogurt clock as a fail safe to remind my stupid bachelor self that I have to go buy more food on a regular basis. Every time I go to Trader Joe’s, I buy six yogurts. I eat one yogurt a day, Mon – Fri, and when I run out I go shopping again. The extra, sixth yogurt is my emergency back up yogurt so if a friend asks if they can have a yogurt, I don’t have to say, “No, those yogurts are a precision instrument, and only I can eat them.” This situation has never actually occurred, but I’m ready for it. Planning out a good shopping trip, given the crazy state of life that is modern city living, is more than a trivial consideration, requiring numerous harrowing encounters with all sorts of biological and mechanical foes. As such, the steady, daily ticking of my yogurt clock is probably the third or fourth most important consideration in my daily life – below the internet and my girlfriend, but above the car. That brings me back, more or less, to Trader Joe’s Soy Yogurt. A yogurt that, like so much vegan food, is not legally a yogurt. Trader Joe’s is forced to concede this point several times on the packaging with the subtitle, “a yougurt-style non-dairy food”. The last yogurt I reviewed from TJ’s, the European-style chocolate-infused yogurts, we’re strikingly off-putting in their zesty taste. There’s no such non-American trickery at play here. Despite the fact that no milk has ever gone into this soy yogurt, it tastes very very similar to your ordinary Dannon or Yoplait. The yogurt is smooth and thick, with a heavy “whipped” style texture and nice bits of chopped up fruit in it. It’s a remarkably close approximation to ordinary, dairy based yogurt, and at first bite you’d never suspect it’s vegan. Both types of the yogurt are also very sweet – too sweet for me in fact. 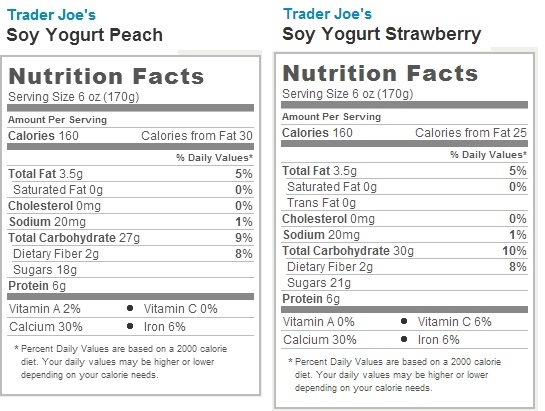 The peach yogurt has 18 grams of sugar per serving, while the strawberry version has a considerable 21 grams of sugar in it – the equivalent of 6-7 packets of sugar in each yogurt. Considering that you can polish off a yogurt in about 6-7 spoonfuls, that’s a serious sugar load for first thing in the morning. While this amount of sugar is certainly not unusual in the super sweet world of grocery store yogurt, it’s more than I like to eat over breakfast. The other consideration, as I hinted at above, is the soy bean-y aftertaste you can expect. Trader Joe’s does their best to keep this under control, but once you’ve finished one of one of these pots you won’t have any doubts that you’ve just had some soy beans. The soy aftertaste is still mild, a gentle graininess of beans on the tongue, but slightly stronger than the Soy Creamy aftertaste. It certainly wasn’t enough to ruin the overall tastiness of the yogurt, but as a guy used to dairy it did give me pause from time to time. Even if I was dedicated to the vegan lifestyle, I probably wouldn’t replace my yogurt clock with Trader Joe’s Soy Yogurt. Though tasty, there’s just too much sugar in guys to eat on a daily basis. I’d much rather swap in fruit or something else a little better for me. The yogurt is a fine and tasty treat, just not a particularly healthy one. Would I Recommend Them: Yes to vegans, but not in general. Would I Buy Them Again: No, they’re too sweet for me. Final Synopsis: A good yogurt, and a great vegan option, as long as you don’t mind a lot of sugar. I laughed out loud at the part about the yogurt clock. Your reviews are always so informative, well-written, and witty. I find our local TJ runs out more than it carries them. Their lame excuse is the comapnay ha a shortage of fruit! Really? in June? I went to the Miami store and was told it is out of stock. Why? Whole Soy, the company that was making the soy yogurt, has closed their doors once again. I wonder why they didn’t license their recipe.